Special private preview of Pink Ribbons Inc. 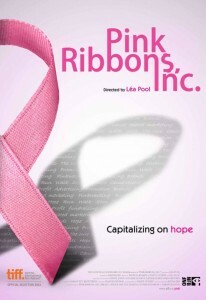 The film is based on Samantha King’s brilliant book of the same name, Pink Ribbons, Inc. which pulls back the pink curtain on why we aren’t making the progress we need to end the breast cancer epidemic. It’s a curtain Breast Cancer Action has been tugging on for over a decade through our Think Before You Pink® campaign, where we encourage people to ask critical questions about breast cancer fundraising. We are thrilled to see this message go mainstream. To ensure a seat at what we expect will be a sold out show, please send your contact information today and you’ll be the first to receive an invitation. This entry was posted in Articles, BCA Events.